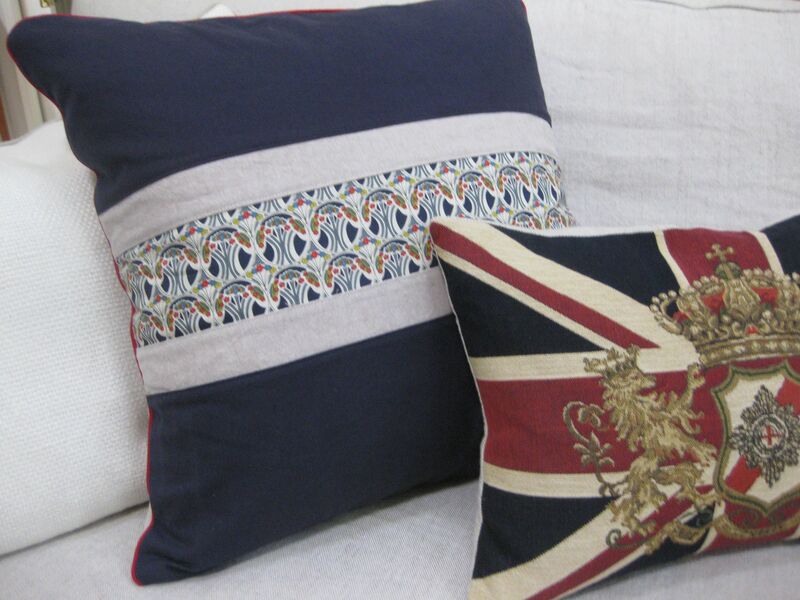 My mother wanted to me to make her some cushion covers to go with some newly acquired Union Jack pillows. While I would have made them for nothing, I did accept two yards of Liberty Tana Lawn in Gray Pepper in exchange. Since I was bartering with my own mother (terrible! ), I wanted to make these covers as close to perfect as I could manage. My mother chose Essex linen in navy and flax and Liberty in Navy Mauverina, and I pieced the front in a simple stripe that echoes the Union Jack. Sadly, when I first cut a strip of the Liberty, the pattern was not straight–even though the fabric was neatly pressed. It worked better to cut the width I needed first (instead of one long strip). Then I used the pattern as a guide to cut the correct height. It was worth the effort–and I’m sure I can find a use for those crooked scraps. I thought about quilting the front panel to encase the seams, but worried that the side seam would be too thick to handle with the piping, which seemed an essential touch for these cushions. 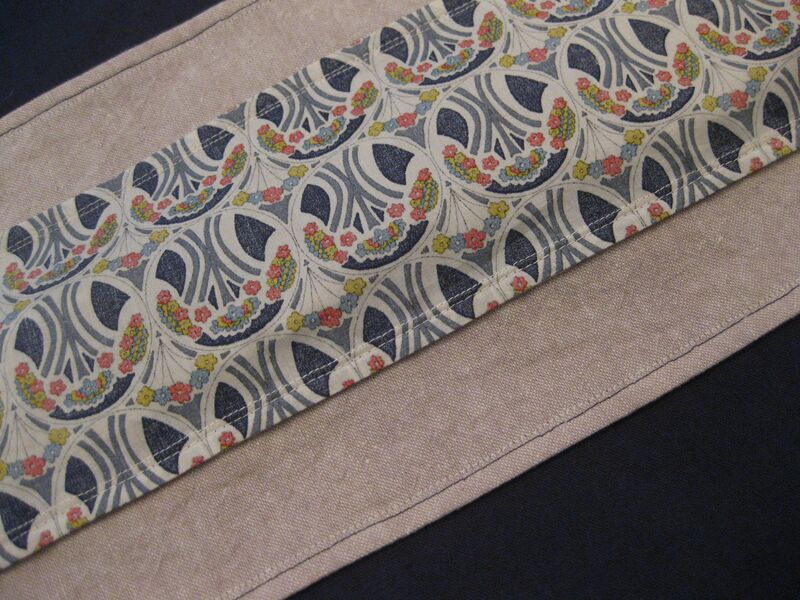 Instead, I used French seams for the piecing and then top stitched close to the seam on the right side. Here is the wrong side–tidy! I finished the cushion with an envelope enclosure in the back and added buttons, which keeps the back opening from gaping. 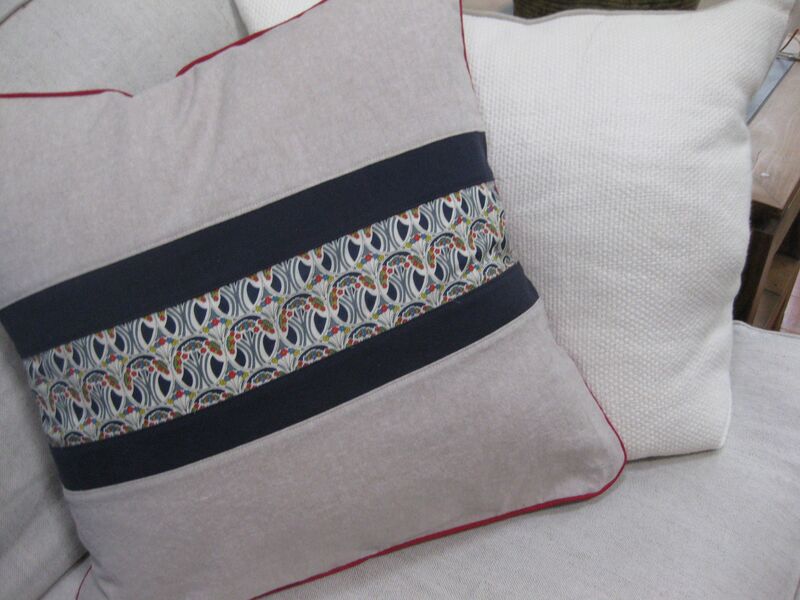 Here is the inverse of the cushion above with the matching Union Jack cushion–pretty nice! This entry was posted in quilts on July 26, 2013 by brigitdermott. I’m with you there – I would work for Liberty too! Lovin’ the pillow! Thanks, Shauna! Now I need to figure out what to do with that Liberty fabric!